New York’s Film Forum began a 40-Film Festival honoring the career of Barbara Stanwyck this weekend that will last through December 31st. The festival which “has too many highlights to name” as David Edelstein of New York Magazine wrote is as great an event as any Stanwyck fan can fathom screening films from every decade of the star’s stellar film career. While I’m saddened I won’t be able to attend the majority of the screenings, I was there for yesterday’s double feature – Billy Wilder’s, Double Indemnity (1944) and Preston Sturges‘, The Lady Eve (1941). Double Indemnity got mostly positive reviews when it opened in September 1944, but audiences made it an immediate hit. The honey suckle is simply mesmerizing. From where I sat the people who packed the Forum yesterday thought so, in any case. They too “wanted to see the dame upstairs again, without a silly staircase” blocking the view. The only thing missing was honeysuckle incense. Seven of us friends gathered amongst the crowd that spanned from serious cinephile to casual classic film newbie and the consensus was basically the same: The dialogue in Double Indemnity is fantastic, Stanwyck really sells the rotten to the core thing, the fact that Fred MacMurray has the “good guy” appeal goes far in convincing us he cannot help but be caught in Stanwyck’s web of deceit. Oh, and what were they thinking about that wig? Two things were confirmed for me as I watched Double Indemnity last night. The first is that there remains no doubt that the introduction of Phyllis Dietrichson wrapped in a towel as she stands high above the foyer of the $30,000 Dietrichson house is among the best character introduction in film. One never gets over that first impression. 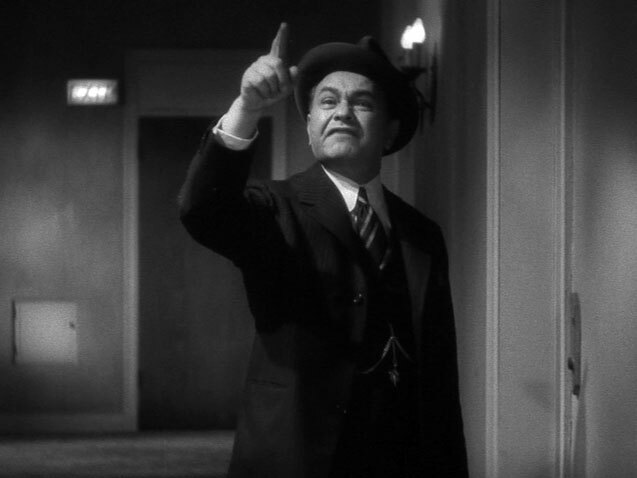 And, the second is that THE standout in the film is Edward G. Robinson as Barton Keyes. Robinson’s depiction of the irritable, funny, big-hearted, insurance adjuster with the “little man” who lives in his gut that serves as a warning when some claim seems “off,” is that much more impressive on the big screen. His physicality as he makes a point, how he uses his cheap cigars, which become key to his relationship with Neff, are perfection. Every line Robinson delivers is a keeper. Bosley Crowther’s 1944 review of Double Indemnity noted “Barton Keyes is the only character you care two hoots about in the film” and he was right. Theresa Brown, a friend and passionate film fan who attended the screening last night said she watched the entire film just waiting for Robinson’s last words to Walter Neff, “Closer than that, Walter.” It’s just a wonderful performance and I couldn’t wait for his scenes. It’s worth mentioning, by the way, that Turner Classic Movies just announced this week that the world premiere of the complete restoration commemorating the 70th anniversary of Double Indemnity will be screened at next year’s Turner Classic Movies Film Festival. I think we should all wear George Washington wigs in tribute! I’ve learned several things about myself this year while attending screenings of classic films in theaters not the least of which as the fact that I am a snoop, thoroughly enjoying overhearing other people’s reactions to movies to see if they’re similar to mine. These moments often stand among my favorites. Among last night’s “moments happened as I stepped outside after Double Indemnity and before the next feature started – I overheard a woman telling her elderly father that perhaps they should have watched The Lady Eve first and Double Indemnity second so the elder could have gotten home earlier. The father’s reply was a quick “No! I wanted to start with a really, really good film and end with a great one.” I just love that and his statement turned out to be the consensus across the board. Sturges’ The Lady Eve is wonderful and while I experienced little new while watching Double Indemnity on the big screen, The Lady Eve was funnier than ever. 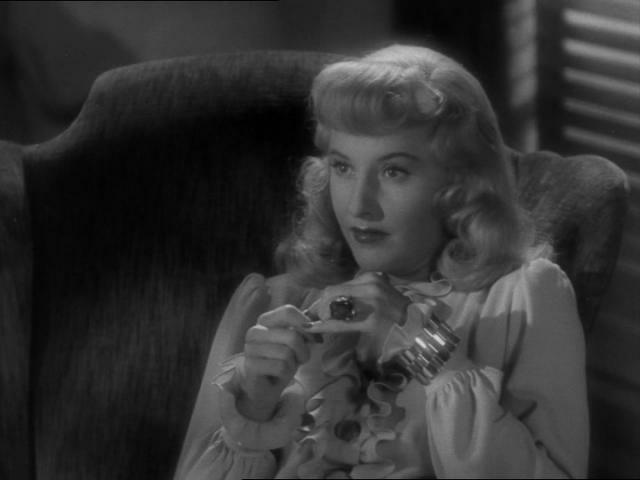 Preston Sturges wrote the screenplay of The Lady Eve specifically for Barbara Stanwyck and she delivers BIG time, one of the best performances of her career, in my opinion. She’s non-stop magical from beginning to end. And, I might add, looks stunning in the film costumed for the first time by Edith Head, with whom she would work many more times. 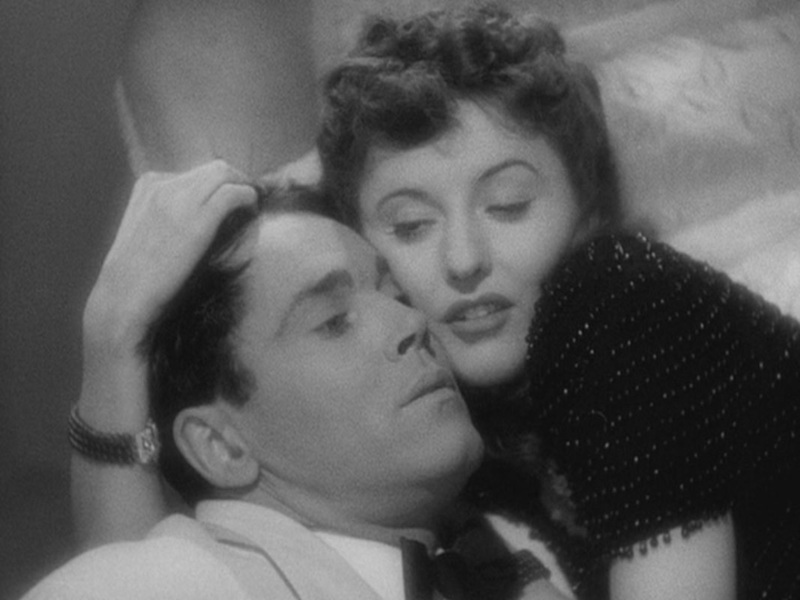 Then there’s Henry Fonda, the perfect Charles to Stanwyck’s Eve. I have to admit I never think of Fonda as a comedic force, but playing it straight, he shines as the naive and very clumsy, Charles Pike (aka Hopsy) in this. And that stellar supporting cast, which features some of the greatest character actors ever. Sturges’ favorite William Demarest as Muggsy, Charlie’s bodyguard/assistant/all around man, Charles Coburn as Stanwyck’s loving, card shark of a father, the hilariously snooty, Eric Blore and in this case, the one who actually makes me cry, Eugene Pallette who plays Mr. Pike, Fonda’s father. All the players deliver line after line in Sturges’ outstanding script with impeccable timing, energy – on and on. I can’t say enough. The Film Forum roared with laughter – in some instances even before the funny scene occurred or line was uttered, so this was an audience of knowledgeable fans. When Pallette demands his breakfast, I cry! There was one particular scene I really looked forward to seeing on the big screen and it didn’t disappoint. 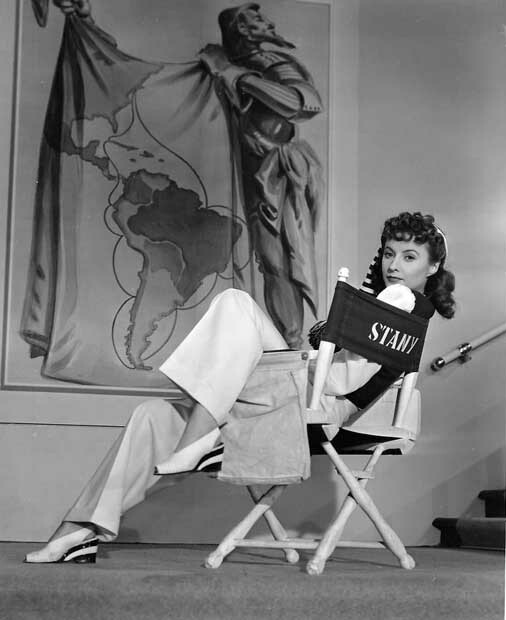 Of the scene, Roger Ebert noted, “If I were asked to name the single scene in all of romantic comedy that was the sexiest and funniest at the same time, I would advise beginning at six seconds past the 20-minute mark in Preston Sturges’, The Lady Eve, and watching as Barbara Stanwyck toys with Henry Fonda’s hair in an unbroken shot that lasts three minutes and 51 seconds.” That has to be one of my favorite scenes in any movie ever and I can only add a reminder – stellar acting and writing trump special effects in the making of movie magic. That. Is. All. As far as experiences I’ve had of seeing my favorite classics on the big screen, last night’s at the Film Forum must stand among my favorites. 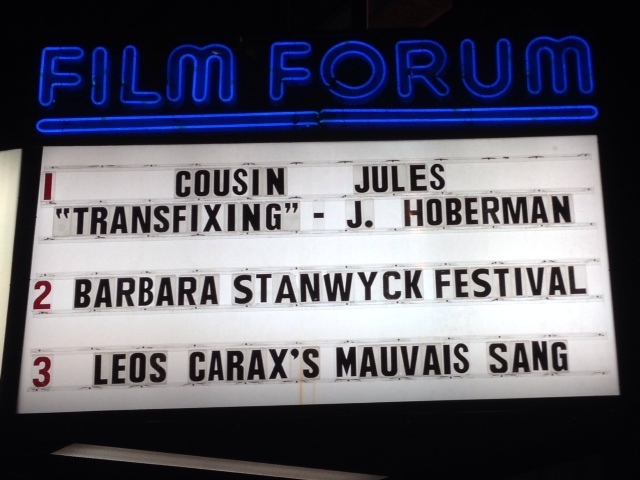 This was my dream Stanwyck double feature and it came true. As far as the “bottom line” at the end of the night I’d say one thing kept coming up – Stanwyck could do it all. And as far as I’m concerned, no two films in her impressive filmography could have proven that fact better than watching Double Indemnity and The Lady Eve back-to-back – not necessarily because they’re her best performances, but because the roles and films couldn’t be more different. It was a wonderful experience and I urge everyone who is able to get to the Film Forum this month to watch Stanwyck after Stanwyck after Stanwyck to do so as often as possible! A shout-out to my film-loving friends with whom I shared this classic film dream – Nyssa, Susie, Joe, Theresa, Will, and Maggie who joined us later for the ever-important post-screening discussion over drinks. You lucky, lucky people in New York. I can so little opportunity to see my favorites on the big screen. Robinson’s last line in Double Indemnity is surely one of the best lines of dialogue ever. It contains a whole story in these 4 words. It’s true, Vienna, there are so many opportunities to see classics in this area. we are lucky. Very good article on one of my favorite actors; I am currently reading Victoria Wilson’s biography. I would go with Double Indemnity and Forty Guns as a great double feature showing her vital range. Thanks so much for stopping in. Another great choice for a double you mention! But I suppose with a talent and career such as Stanwyck’s this would be a long debate. It’s impossible to be wrong in choosing any number of films to feature that wouldn’t blow our minds. She was just one of the greatest!! I have the book but haven’t been able to start it yet. Can’t wait! Hey Citizen Screen…another wonderfully well-written article by you, and about two of Stanwyck’s sublime performances. Post screening discussion was fun with your gang, and I’m ready to do it again. Oh…and THANK YOU for that shout-out in your review! I feel I’ve been given the stamp of approval with your mention. I loved how you put it: “Stanwyck after Stanwyck after Stanwyck.” Not a bad way to while away one’s time. Oh boy! Double Indemnity AND The Lady Eve? Nice!! What a wonderful double feature! Wonderful post, Aurora. You’ve really captured what I personally love about both films. I know! Such a fun time! Thanks, Ruth – wish only that many more of us could watch these together. Imagine how great that would be! I really adore these films too, and wish I was on the other coast. I’d take seeing a double feature of Stanwyck’s worst over 99% of the dreck currently infecting my local multiplex. That being said, I wish my friends enjoyed Double Indemnity as much as me. As it is, they prefer the remake– but only because it’s so bad that they love making fun of it. No doubt I also prefer these to current films, Danny. It’s such a treat to be able to see them on a big screen. I’ve never seen the remake and honestly, had forgotten one was even made. 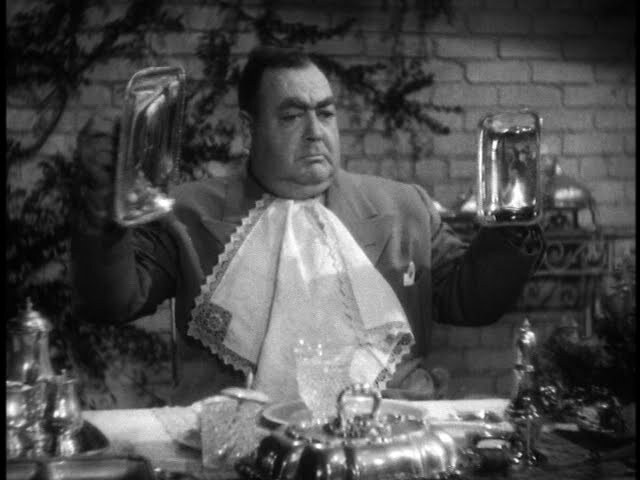 I love Eugene Pallette. Whenever I see him I think of the movie It Ain’t Hay with Abbott and Costello. There is a great funny scene with Pallette in this film. Pallette’s character is standing on a horse racing track when a security guard coms up to him and says ” get off the track before somebody puts a saddle on you.” All kidding aside Pallette was a great actor. What an incredible and distinctive voice he had.